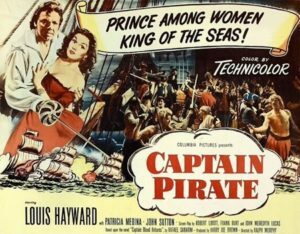 The black-and-white Fortunes of Captain Blood (1950) must have done well, because Columbia upped the production ante for this Technicolor sequel, which is quite good despite its reeeeally stupid title. (I blame Columbia’s marketing department.) Like Fortunes, it stars Louis Hayward and Patricia Medina in a story loosely based on a book by Rafael Sabatini, in this case Captain Blood Returns (1932). The writers borrowed some incidents, characters, and names from Returns, but this is an original story, and a good one; it hews closely to the historical feel and personality of Sabatini’s tales, which hinge on the balance between Peter Blood’s ruthless cunning and innate decency. The plot here is a member of the “The only way to prove I’m not the murderer is to catch the real killer” club, piracy chapter. Blood, now a retired and respectable Jamaica planter, is on the verge of marrying Doña Isabella, whom he rescued in Fortunes, when he’s arrested and accused of returning to piracy to attack the port of Cartagena, on the evidence of Isabella’s Spanish cousin and that of Hilary Evans (John Sutton), Blood’s rival for her hand. With Blood in prison, Isabella takes over; at her behest Blood’s first mate reforms his old crew (there’s a fine rallying-the-crew montage delightfully scored to the tune of “Drunken Sailor”), Evans’s ship is boarded and captured in Port Royal harbor, and Blood is freed to sail off and try to determine who really raided Cartagena in his guise. What follows is a high-seas detective story on the Spanish Main that takes Blood and his crew from Port Royal to Tortuga, Martinique, Santo Domingo, and Puerto Bello, bargaining with, bamboozling, and bullying a series of gratifyingly unsavory characters of every stripe, always just ahead of the pursuing English and Spanish navies. There are some tense action scenes, in which Hayward shows that he’s not only improved his already-capable fencing skills, but has added judo into the bargain, throwing scurvy dogs and Royal Marines around with equal abandon. The final duel with Sutton in a burning fortress is pretty thrilling. Does Blood finally track down the true culprit, clear his name, and marry Doña Isabella? What do you think?